Theres plenty of quiet & fairly flat routes to choose from but these ones all have a pub or cafe halfway. Takes an hour and a half. Starting point is the grotto at the East End of the town where the Tralee & Listowel roads meet. Some uphill but fairly easy. Keep to the road on the left until you hit a larger road at a T junction, take a right down this road, over the bridge & into Lisselton. Tomaisins is a nice place for a Guinness if you feel like taking a break & rewarding yourself. You can take the same route back or head back the busier main road into Ballybunion. Lovely, peaceful country lanes lined with gorse which smells of cocounut when its in bloom. Starting point is the Cliff Road overlooking the ladies beach. Takes about two hours. Take the road out of town, its the uphill one. Keep going until after about a half mile you see an old church on your left, take a left here. Keep to this road until you see a pub called the Store, take a right here & right again a couple of hundred yards later. Keep to this road & it will bring you right back into town. A fair bit of uphill sections. Ocean & estuary views, quiet country lanes, old bridges, beachs, dunes & farms are some of the features of this route. The Store is a great place for al little reward be it a Guinees or an ice cream, and a chat with some locals. Takes about an hour. Starting point is the statue of Bill Clinton, on Main Street. Cycle down the street throught the village, keeping left at the Golf hotel & keeping to the right at the next juction. Keep to this road taking a left when you pass the clubhouse of Ballybunion Club house, take another left at the main road after you pass the Golf Village & this will take you back into the village. There's a cafe in the Golf Village about halfway if you want a snack or a drink. Great views of the Golf course & beaches. If you'd like to see & do more take the right hand turn right after the clubhouse & keep on this till you get to the carpark. Look down the river to your left & you'll see the Salmon fishermen hauling in their nets & the fishing village of Ballyduff across the river. This was the scene of the largest faction fight in Ireland when Ballybunion & Ballyduff had a bit of a disagreement on the beach here. Theres a stone in the far corner of the car park that will tell you more. The remains of Stone Age cooking areas were also found here, some of the earlier visitors to the area. 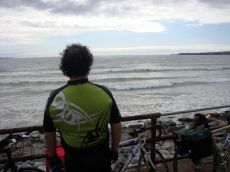 For more information about the Cycle Routes around Ballybunion just e-mail or Call today on 0866000665.